This spectacular private estate is a sanctuary nestled in Pleasant Valley, Corralitos. 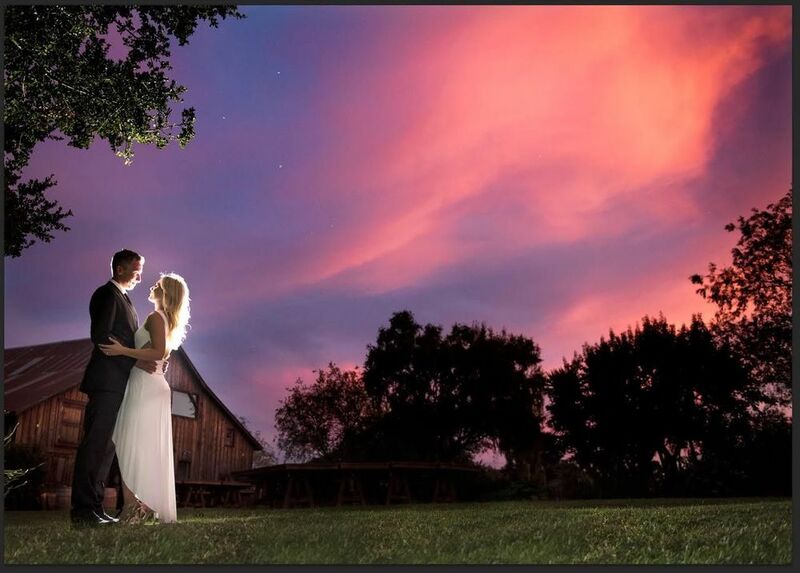 Deer Park Ranch is unique and hard to compare to any other venue in the Bay Area. Our one of a kind estate has many beautiful features at every turn that hosting your event here will give your guests something to talk about. 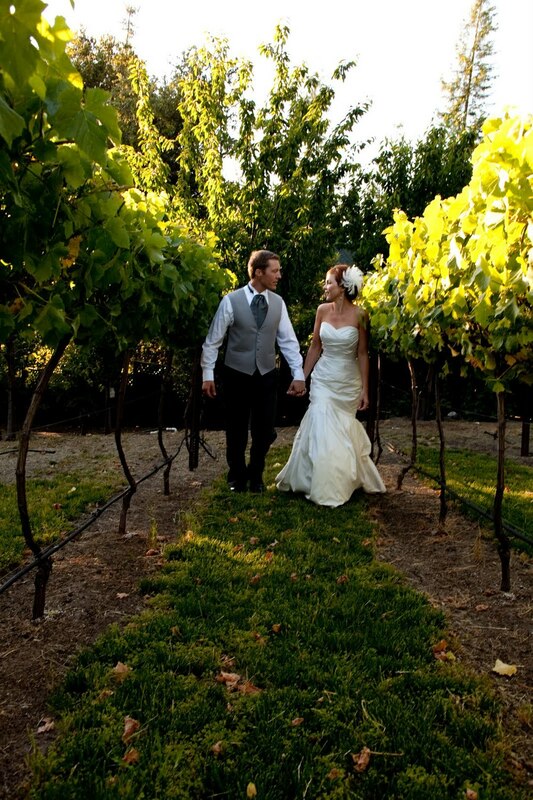 Celebrate your special occasion in an intimate atmosphere and design the wedding of your dreams surrounded by vineyards, beautiful redwoods, oak trees and manzanita groves. Wonderful Wedding for Nick & Gabbi! 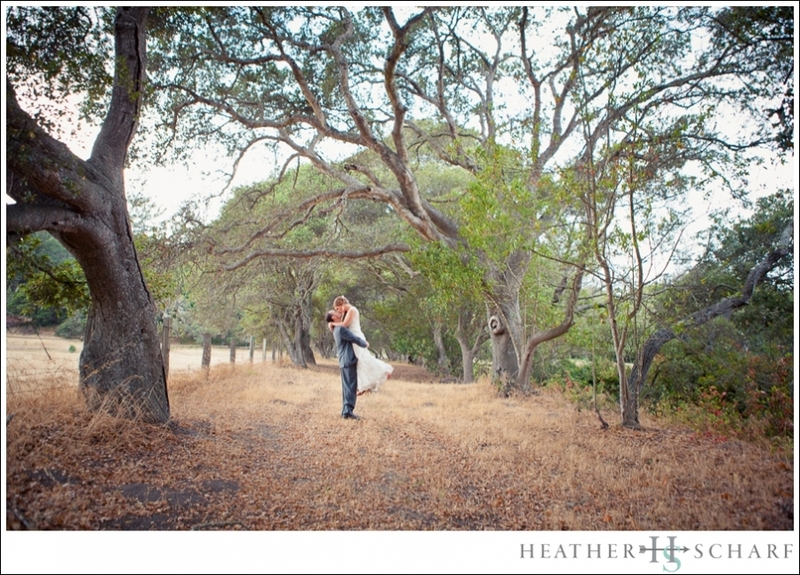 There is nothing more enchanting than a wedding at the Monterey Bay Aquarium. It truly is an amazingly unique site and your guests will feel extra special having the place all to yourselves! You may rent either the Open Sea or the Ocean’s Edge for the evening beginning at 7:00 pm. Located just minutes from Scotts Valley and downtown Santa Cruz in the majestic Santa Cruz mountains, Redwoods provide the backdrop for this historic 83-acre ranch. The driveway borders the vineyard and there is plenty of parking on the property. 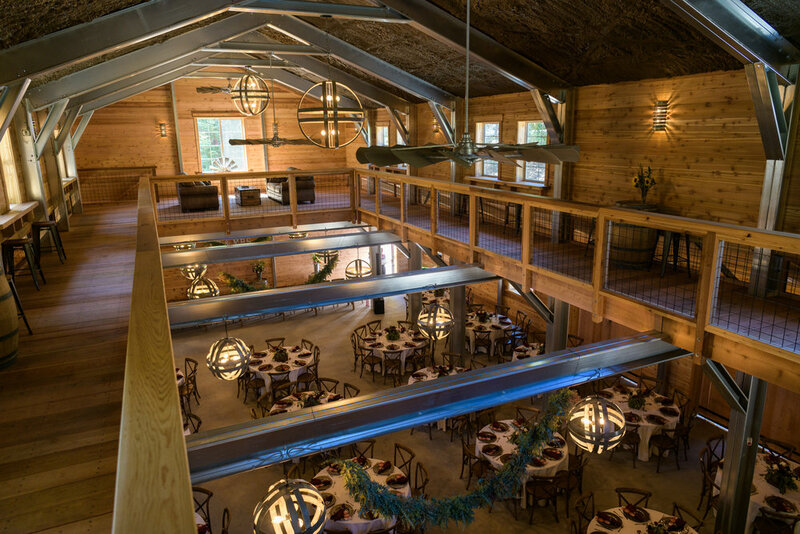 The centerpiece of the venue is a furnished barn complete with a huge river rock fireplace, tables, built-in bar, and dance floor area. 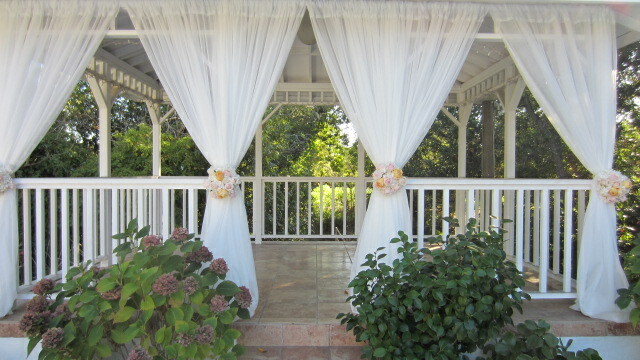 Several lawn areas are available for the ceremony, and a unique canary aviary and outside bar/BBQ area adds charm. 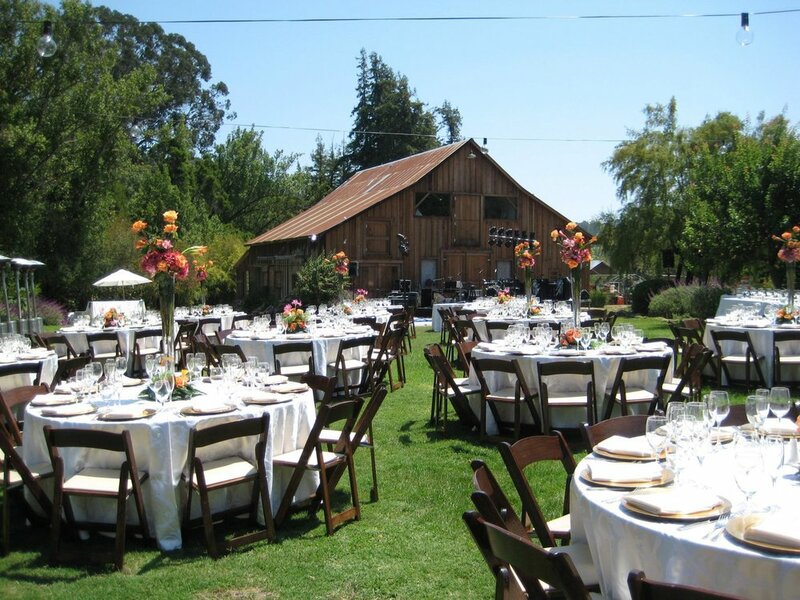 Events may last until 10:00 pm and the barn provides an indoor space that can be extended with tenting. Conveniently located minutes from Soquel Village, this beautiful private estate has the feel of being out in the country, yet there’s a Spanish Hacienda-type feeling of old historic California in the buildings. Soquel Creek runs through the property and a wooden footbridge connects the two parcels. A historic water tower and beautiful old barn serve as the artist-owner’s studio. Path lighting and grape arbors lead the way through the beautifully landscaped gardens. The drone video that is below will give you a great idea of the layout of the property. 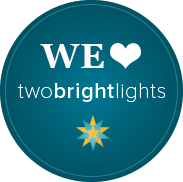 Many amenities are included in the site fee including a dance floor and bistro lighting throughout the property. Important to note that we only do one wedding per weekend allowing full flexiblity in scheduling rehearsal. This includes: Use of grounds for rehearsal on day prior to wedding and then use of the grounds and the following on the wedding day: barn, 3 built in bathrooms, bridal changing cottage for bride and bridesmaids, bocce ball court area for groom and groomsmen, use of all lounge furniture and tables on property, 9 movable craftsman made teak benches, stone dance floor adjacent to gazebo, bistro and twinkle lighting above dance area, iron arch, outdoor gas fireplace. In addition, the parking lot holds 120 cars which can safely be left overnight and picked up the following morning. Nestled in the Santa Cruz mountains, yet easily accessible, River House is a blend of rustic hideaway and country estate. One of the most beautiful aspects of the property is the wisteria covered arbor that leads the bridal party to the wooden gazebo overlooking San Lorenzo River. 10,000 square feet of lawn easily accommodates up to 250 guests for dining and a large aggregate patio serves as the cocktail area. 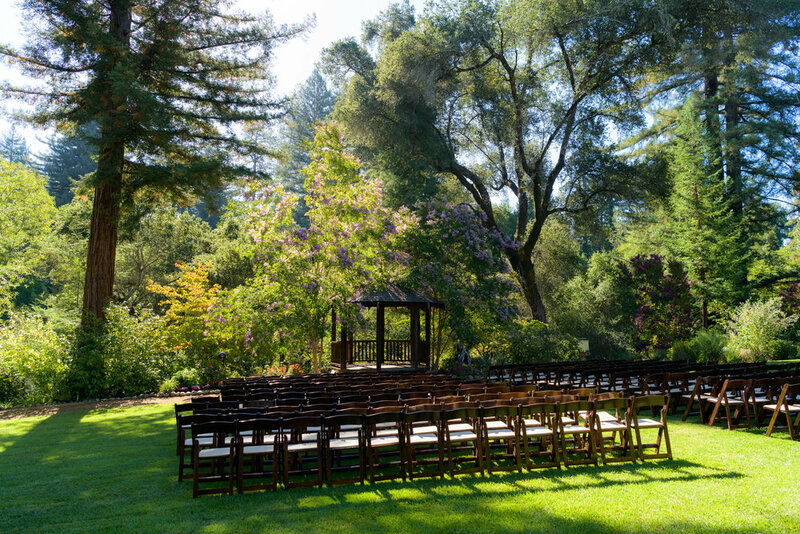 A Redwood grove is available for the ceremony or a small cocktail hour. Flower-lined paths encircle the property. Catering station and bridal cottage included. 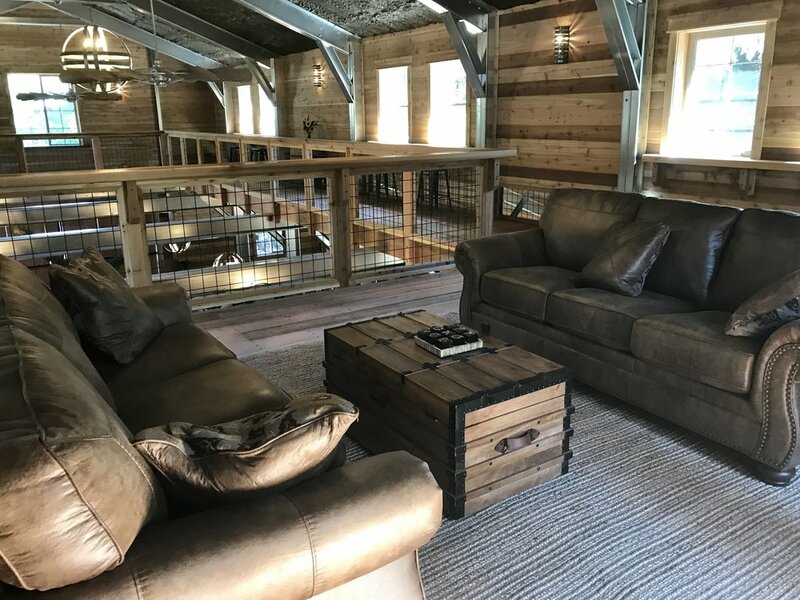 A 3500 square foot barn has just been completed and is available for 2019 bookings. The Rustic/Industrial barn is furnished with custom lighting and windmill fans. A 600 Square Foot lounge on the second floors allows for relaxing and viewing of the dance floor. A wrap around cat walk circle the second story. More photos will be added here after our first wedding late September. Check out the drone video below for a bird's eye view of the property! A Little Rain Didn't Stop the Party! Beautiful grounds and Hampton style home in rural La Selva Beach. Stunning, full ocean views and fantastic sunsets. Can accommodate up to 200. This includes: Use of the grounds, full coordination, use of the bridal suite inside the main house for the bride and bridesmaids, and coordination. Just off Hwy 17 in Scotts Valley, perched on top of a hill among the redwoods sites Timber Ridge Estates. This beautiful estate is a hidden paradise, but so close to everything. 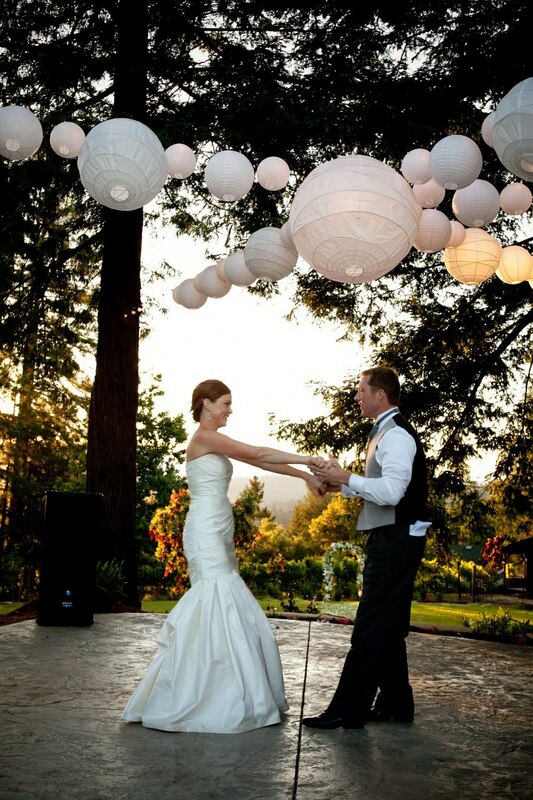 Marry in the Redwood-surrounded gazebo or on the sprawling lawn in front of the vineyard, the choice is yours. Add a gorgeous ocean view from the pool side patio (perfect for cocktail time) , a wood burning pizza oven, and a guest house with the most photographic staircase you will ever see and you’ll understand why Timber Ridge is the best of everything. Brand new venue for 2019! Authentic 1800's Apple Barn! This historic barn has been fully restored from the floors to roof and is now ready to book your special event. The working apple orchard has been around since the 1800's and sits on 15 acres of gorgeous land in Corralitos. The orchard produces heritage Granny Smith, Red Delicious, Pippins and many other varieties. 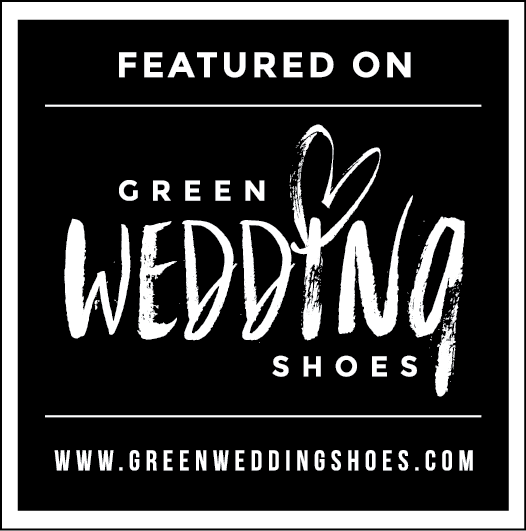 The landscape changes with the seasons…It is loaded with blossoms for your Spring wedding and the trees are full of amazing smelling apples in the Fall. 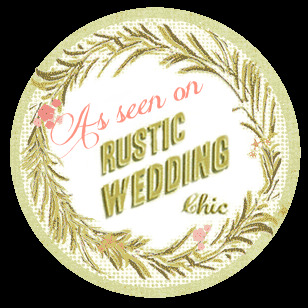 They are able to do weddings year round due to the spacious barn and flat fields, perfect for tenting. 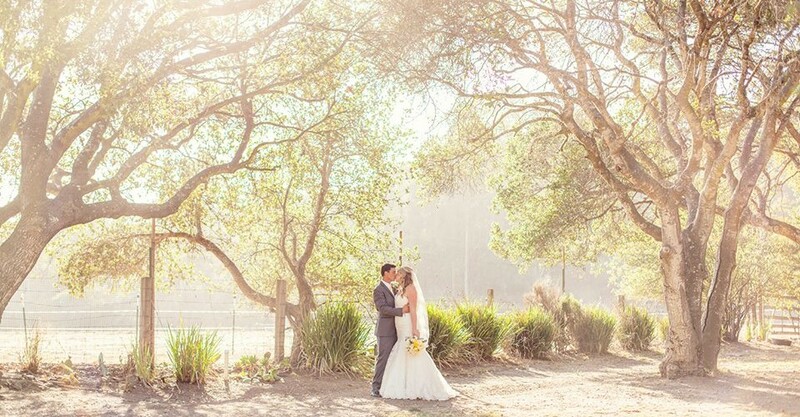 The farmhouse and barn are surrounded by Oak, Redwood and Eucalyptus groves that will make an amazing backdrop for ceremony and alfresco dining. Cocktail hour could be on the barn porch and there is plenty of room for dancing and cake cutting inside the barn after dinner. 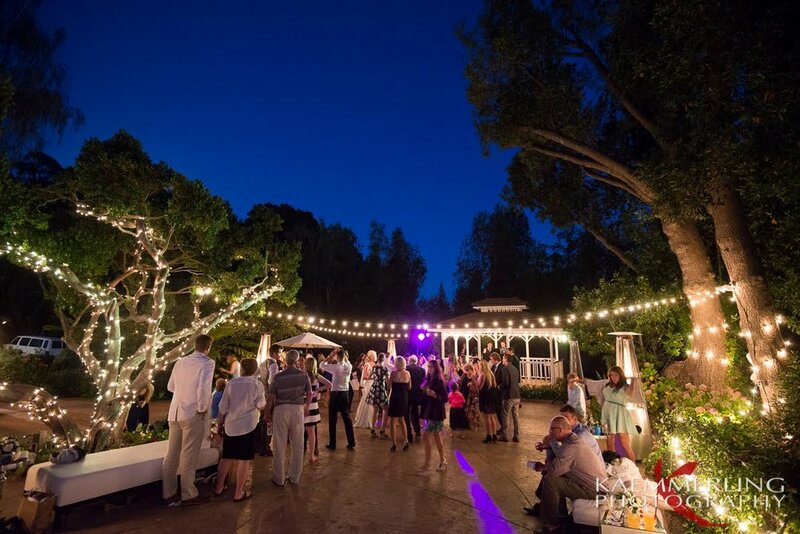 Bare bulb lighting is installed inside and out for evening events. Inside the farmhouse is a bridal room for getting ready with floor to ceiling windows of the fields and orchard outside.